The CCTG CO.26, ReDOS, and IMblaze370 trials, although not all positive, are all trials that have shaped approaches to treating patients with advanced refractory colorectal cancer (CRC). 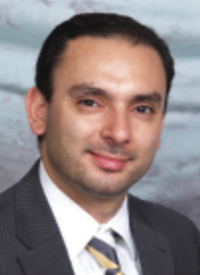 “These are thought-provoking studies that were presented at the 2018 and 2019 Gastrointestinal Cancers Symposium,” said Iman Imanirad, MD, in a presentation during the 2019 OncLive® State of the Science Summit™ on Gastrointestinal Malignancies. At the meeting, Imanirad, a medical oncologist at Moffitt Cancer Center, discussed these trials in depth and their impact on patients with refractory metastatic CRC. In the Canadian trial, investigators examined the combination of durvalumab (Imfinzi) and tremelimumab in patients with advanced refractory disease. This combination of CTLA-4 and PD-L1 inhibition resulted in benefit regardless of whether the patient had microsatellite instability-high (MSI-H)/mismatch repair-deficient tumors or microsatellite stability (MSS) disease, said Imanirad. Patients were randomized 2:1 to receive 1500 mg of durvalumab every 28 days and 75 mg of tremelimumab every month for the first 4 cycles of therapy alongside best supportive care (BSC) every 28 days or BSC alone. Overall survival (OS) served as the primary endpoint of the study, with secondary endpoints of progression-free survival (PFS), objective response rate (ORR), safety, and toxicity. Patients were well balanced between arms in terms of age, performance status, and prior therapies, added Imanirad. All patients had received irinotecan, and almost all had received 5-fluorouracil and anti-VEGF therapy. Approximately 80% of patients had prior exposure to oxaliplatin. Patients who harbored a RAS wild-type mutation also received anti-EGFR therapy. Notably, more patients enrolled in the experimental arm had KRAS mutations compared with the control arm, and more NRAS mutations were observed in the control arm than were seen in the experimental arm. Approximately two-thirds of patients had also received radiation therapy. Patient accrual occurred fairly rapidly from August 2016 to June 2017, said Imanirad, during which time 180 patients enrolled on the trial. Among the intention-to-treat (ITT) population at the time of data cut off in August 2018, 21.8% of patients had stable disease in the investigational arm compared with 6.6% in the control arm.1 OS favored patients who received the immunotherapy doublet at 6.6 months compared with 4.1 months in the control arm (stratified HR, 0.72; 90% CI, 0.54-0.97; P = .07). Notably, PFS was 1 month worse with the immunotherapy doublet versus BSC (1.8 months vs 1.9 months; stratified HR, 1.01; 90% CI, 0.76-1.34; P = .97). OS benefit was noted irrespective of subgroup, said Imanirad. Quality of life (QoL) was included as a tertiary endpoint and was assessed based on the EORTC QLQ-C30. “There was no significant difference in QoL as it pertains to the deterioration of the patient’s physical function and global health status,” added Imanirad. In terms of toxicity, 64% of patients in the investigational arm and 20% of patients in the control arm experienced grade ≥3 adverse events (AEs), the most common of which were fatigue, abdominal pain, and lymphopenia in the investigational arm. Due to the off-target effects of regorafenib (Stivarga), its toxicity is ill-tolerated by many patients, explained Imanirad. As such, this phase II trial was designed to assess regorafenib in a step-wise manner to see if it could be better tolerated. The proportion of patients who were able to complete 2 cycles of treatment and initiate a third cycle served as the primary endpoint of the trial, with secondary endpoints of OS, PFS, and time to progression. In the experimental arms, patients with an ECOG performance status of 0 or 1 received 80 mg of regorafenib for the first week of treatment and were escalated every week thereafter by 40 mg, after which they received the standard dose or last best tolerated dose. Patients in the control arm received a standard dose of 160 mg daily.